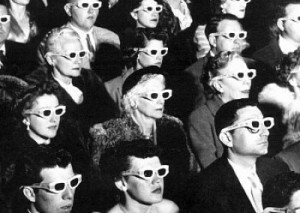 I’ll get to how you can buy cheap tickets to see the latest blockbusters in 3D in a sec. First, let me put on my GeekReads movie reviews hat for a bit and say a few words: 3D movies were already starting to become mainstream long before Avatar came along, despite what the industry seems seems to think. Several (mostly Disney) animated movies such as Up, Coraline, Bolt, G-Force had already paved the way. Truth is, what James Cameron’s epic heralded the tipping point at which people started being enticed away from their home theatre systems and out of their own lounge rooms and back into cinemas. The movie’s biggest accomplishment wasn’t the technology, the visuals or the story, it was the takings – Avatar is currently the top-grossing movie of all time. There’s a catch though: Avatar didn’t actually sell more tickets than other movies, the cinemas simply charged more by imposing a “3D tax” on the cost of the ticket. Prior to this, cinemas had been battling with declining patron numbers and increased competition leading to plummeting prices. Suddenly, they had an excuse to raise prices: the cost of new projection hardware, providing the 3D glasses… rubbish. Recently, when a ticket seller told me that the extra charge was to cover the cost of providing the glasses, I produced my own pair to see whether he’d waive the fee, but sadly not. Fortunately, there’s a cheap way to see 3D movies. Not only that, but on the largest screen possible: IMAX 3D. Normally, a full length feature movie there would set you back a hefty $27.50 (in Sydney), but I discovered that by using the Australian Movie Voucher you can see an IMAX movie in 3D for under $11 – less than half price! You can also use them at heaps of other non-mainstream cinemas including Moonlight, Palace, Dendy, and a whole bunch of other independents in your city. Where to get them? If you work for a large company, check with your employee benefits scheme and see whether they offer it – I’ve heard of some places selling them for as low as $9 each (in books of 10). Personally, I get them through Always On Sale, since you can earn bonus points through a whole bunch of reward schemes (Westpac Altitude, Rewards Central, etc.) plus 4% cash back through MoneyBackCo. All up it works out to be just shy of $11 as mentioned before (less if you buy lots and get the benefit of their shipping discount on multiple items). Don’t pay close to $20 at Event and Hoyts cinemas any more, use the Australian Movie Voucher, and see your movies in style!